What is about murder that so enthralls us? Curiosity, probably. ‘Not so much about the actual act—which is usually nasty and decidedly rude—but about whodunit and why. The whodunit genre is relatively new in literature. With Shakespeare and those who followed to the mid-1800s, murder was there, but we never had to wonder—or try to figure out—the who or the why. In 1860, Wilkie Collins gave us The Woman in White, after which no one could get enough ghost stories. But there was no detective work required. The ghost dunnit. It wasn’t until the two Masters came along that society became hooked on murder mysteries. ‘The Masters’ being, of course, Arthur Conan Doyle and Agatha Christie. There’s no way of settling the argument of whose stories are better, but it was Christie who created what has become history’s most cherished, and most durable, whodunit. In 1955, after two SRO years, Attenborough left. Takings plummeted, the theatre gave the production notice to quit, and that created what is now called ‘The Mousetrap Effect’, i.e. when people heard it was closing, they flocked to performances. The play stayed. By 1958, The Mousetrap was the longest-running play in British history. By the mid-‘70s, it was the longest-running play in theatrical history—anywhere. 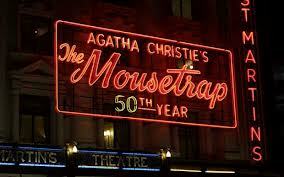 On December 16, 2001, The Mousetrap celebrated its 50th anniversary. By that time, its lines had been spoken by 297 actors, some of whom are in the Guinness Book of Records: David Raven was named ‘Most Durable Actor’ after he completed 4575 performances as Major Metcalf; the late Nancy Seabrooke set her record by spending 15 years as a Mousetrap understudy. 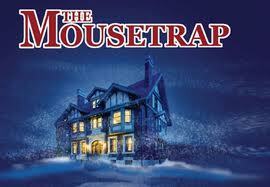 The Mousetrap is about a group of strangers who find themselves snowbound in a country inn, Monkswell Manor. There is a blizzard without; within, they are subjected to terrors at every turn. It’s funny, it’s fun, it’s harmless and, to traditionalists, it’s a charming fragment of a lost dramatic age of polite, witty dialogue and clean humour. But to many modern critics, some of whom have spent their careers campaigning to have it shut down, The Mousetrap is tiresome folly—and it’s got the gall to take up a coveted venue in London’s West End. Tough. The Mousetrap is more than a tourist attraction—it’s an institution, and it’s not going anywhere. In 2000, the set was finally replaced. Although it doesn’t yet have a wind machine—an old canvas drum and elbow grease still create the sound of the blizzard. Miss Christie would find this most amusing, I suspect. This entry was posted in Literature, Poetry, Fiction and tagged AgathaChristie, Arthur Conan Doyle, Christie, David Raven, entertainment, literature, Mousetrap, Richard Attenborough, three blind mice, Wilkie Collins, Woman in White.